Here’s our take on a promotional poster for MRDA Championships 2015. Nice, eh? 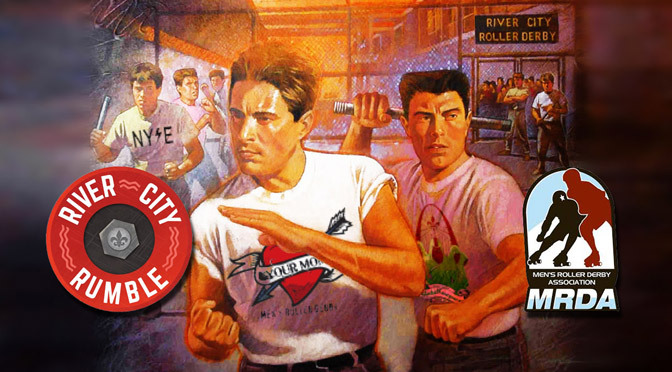 The Men’s Roller Derby Association, in partnership with the St. Louis Gatekeepers, are ready for “River City Rumble,” the 2015 MRDA Championships. This weekend marks the fifth champs tournament held under MRDA sanctioning, and it’s looking like it will be the biggest ever. No, really. It will actually be the biggest ever. The MRDA has expanded the tournament to include two additional teams, on top of the eight teams it has been inviting, to create a 10-team field. It’s still a two-day tournament, so there will be a lot of games happening across Saturday and Sunday. The official bracket and schedule. The expansion of the tourney comes as the MRDA itself continues to expand. Now 64 member leagues strong, the organization is slowly but surely making advances in men’s roller derby. One advantage the MRDA has is the relative consistency of competition near the top end of the field. Though Your Mom Men’s Roller Derby is coming into the finals as the 3-time defending MRDA Champion, the team has had several challenges to their title and corresponding undefeated streak over the years. This year’s main challenger, the St. Louis Gatekeepers, are actually favored by some to win it all in 2015. 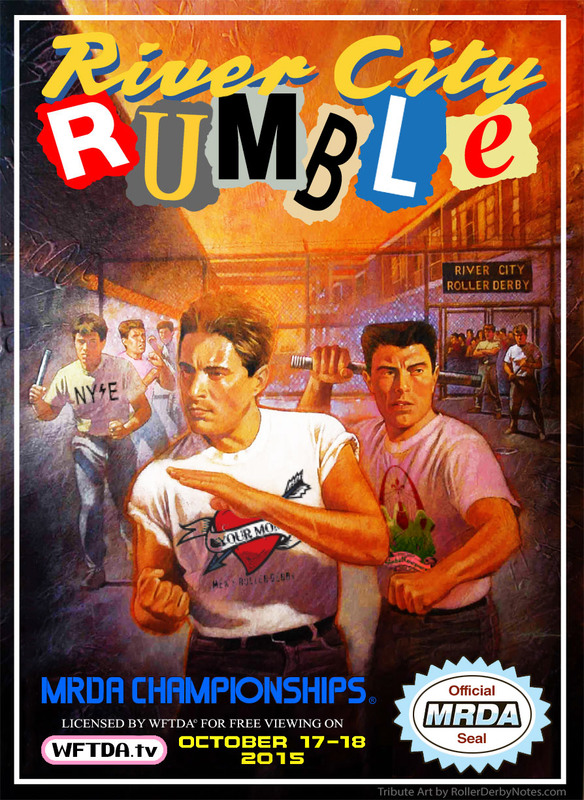 The name of the tournament, “River City Rumble,” seems very appropriate, given that the quality of the men’s field has never been higher, or deeper. 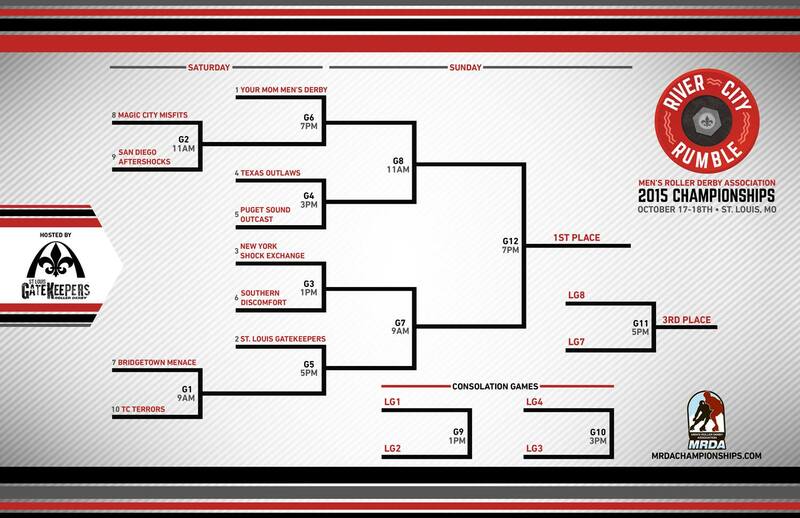 A lot of very tough and very physical games are expected in the main bracket and in the abbreviated consolation brackets. No doubt, a few of them will be quite close. If you want to watch the action as it happens, you can see it live over the Internet. As it has in previous years, the MRDA is partnering with the WFTDA to bring the webcast of the tournament to fans on WFTDA.tv free of charge. Coverage begins with the first game Saturday morning, and continues through both days until the championship final on Sunday night. Let’s look over the teams vying for the 2015 MRDA Championship, complete with their first opponents on Saturday and links to the official team charters. Who is the most dominating roller derby team in the men’s division, going for their fourth-straight MRDA championship trophy this weekend? The team with a name that’s a built-in joke is anything but one on the track. YMMD hasn’t lost a game since September 2012. Despite several close finishes that put that streak in jeopardy, the Iowa squad has always managed to come out ahead. Nowhere was this more apparent than at MRDA Champs last year, where Your Mom beat Puget Sound by 16 points and eternal rivals St. Louis by 33 in the final to claim their third straight title. Your Mom has played three games against teams also in the tournament. They had little trouble against 10-seed Twin Cities (233pt win) or their potential first opponent, 8-seed Magic City (108pt win). Their season opener in March against the New York Shock Exchange was different, however. YMMD won, but only by 39 points, 164-125. That’s not so big of a difference between the #1 team and NYSE, which is ranked #3 in the MRDA. If Your Mom is to make it four in a row, it’s got a much tougher test ahead of it than ever before. After what would seem a shoo-in win on Saturday, they will face an opponent that is capable of beating them in their first Sunday game in either Puget Sound or Texas. Should they win that one, there’s no doubt that they’ll go up against an opponent in the final that CAN beat them. Even if this has been the case for YMMD in previous years, the fact is that they’ve come through every time. Will this year be different? Always the best man, never the groom. Consistently one of the best teams in the MRDA, the Gatekeepers have yet to confirm that status with a championship. They’ve been involved in a lot of heartbreaking losses over the years, the most famous of all was when they came up 1 point short against Your Mom in the 2012 final.1 St. Louis was second banana to Your Mom last year, too. Is 2015 finally the year? There are signs that point to yes. One can’t discount the home-court advantage they’ll enjoy. Flat Track Stats, which keeps its own rankings for men’s teams, lists the Gatekeepers as the current #1 team in the MRDA despite their official #2 ranking. Maybe their crushing 222-66 victory over 5-seed Puget Sound is part of why. There is a crack in the armor of Gatekeepers, however. Their performance against a newly-merged Texas Men’s Roller Derby, the tourney 4-seed, is mixed. The two squads played each other three times this year. At Spring Roll, St. Louis won by 48 points. At Midwest Brewhaha, Texas shocked with a 175-165 upset win. The Gatekeepers would get revenge on their only loss this season, winning by 112 at home two months ago. Though the most recent result is probably the best gauge of where the team stands right now, that loss does make you wonder if St. Louis can take the pressure, of which there may be a lot of. You’re playing at home, and you’re considered the best team in the MRDA by some. The Gatekeepers know that if there’s ever a time to confirm that, it’s now. New York was once the big apple of the MRDA. Once Your Mom and St. Louis rose to power, NYSE seemed to be a step or two behind. The team has one silver and two bronze medal finishes at Champs the past three years, as they have always been a strong and consistently good team. But they were never in a position to truly contest for the gold. It’s difficult to say whether or not the Shock Exchange are in position to improve upon their recent tournament performances. Their 33-point loss to Your Mom is encouragingly close, but NYSE would have to get through St. Louis on opposite side of the bracket to have a chance for a rematch in the final. StL/NY games are notoriously tough, but Champs last year the Gatekeepers didn’t face much resistance in their 93-point win over New York in the semis. Though this one was unsanctioned, the “games” that were included a 681-point win against the Hooligans (Philadelphia) and 758-point win against the other Hooligans (Capital City). Say what you will about the number of emerging men’s teams and the lopsided mismatches that must inevitably occur because of them, but there’s no arguing that these results will have done diddly-poo to prepare NYSE for the level of competition on offer in St. Louis this weekend. However, one would still have to say that the New York Shock Exchange are likely to come out of yet another MRDA Championships tournament with some kind of accolade. They’re favored for third place, easily. Anything better than that will be tough. Here we have a case study of what happens when two leagues from the same metro area combine to form one team representing one region. The established team, Dallas Deception, had made Champs appearances in 2011 and 2012. An hour to the north, the new guys at Denton County Outlaws finished 6th in their MRDA tournament debut. When these two good teams got put together earlier this year, you wind up with a great team. Indeed, the newly merged Texas Men’s Roller Derby has put on a hell of a showing in 2015. Even accounting for their two losses against the Gatekeepers later in the year, the fact that they beat them only a few months after reforming is impressive. They’ve also a 97-point win over 7-seed Portland Men’s in a game played in St. Louis two months ago. You know who else they beat? Puget Sound, the 5-seed and their first opponent of the weekend. A few days before they beat the Gatekeepers, the Outlaws outlasted the Outcasts in a 186-98 Texas victory. With an outstanding year like that, Texas should win at least one game this weekend. Hopefully for them, their first will be against Puget. If that win happens, they can get a crack at Your Mom, who is not as strong as they have been. Let’s see if they can play like they did in beating the Gatekeepers the first time around this weekend. Seattle might be thought of as a wildcard team. Flat Track Stats has them and Texas in a practical tie with each other in FTS rating points. Mathematically, the teams look equal. The level of talent available to each team isn’t so different, either, though Puget does have a lot of new boys on the team. Their play on the track tells an altogether different story. Yeah, yeah, that loss to Texas earlier this year is going to hang over them on Saturday. Their 156-point loss to the Gatekeepers at Brewhaha takes them out of consideration for any major prize. Their 42-point win against 7-seed Portland at The Big O, though still a win, doesn’t feel like a very strong result given the team’s history. If Puget Sound wants to improve their seeding, there’s no question they need to get off to a strong start in their opening game. London’s men’s team, and sole international representative at MRDA Champs 2015, has had a good season abroad. They won the Men’s European Cup in July, beating #9 (and Seed-Not-Appearing-in-This-Tournament) Tyne & Fear by 72 points for the title. Earlier in the year, the two teams met in a much closer contest. T&F beat Discomfort by just 3 points in the year during the British derby season. The only question for SoDisco this year is whether or not they can grab a win this weekend. Last year, the team upset Portland 177-163 on their way to a 5th place finish. This year, a 10-team bracket and fewer consolation games will make it much more difficult for the middle seeds to take a game. NYSE seems like a safe play to win in their opening game, leaving Discomfort to face either Texas or Puget Sound in their one-off consolation bout. If they can’t make it happen there, they’ll go home to England winless. The new tournament format will be of benefit to the Bridgetown Menace. Last year, they had to face two strong teams in Puget Sound (lost by 50) and Southern Discomfort (lost by 14). They put up good showings in both of them, but had no positive results on the scoreboard to show for it. This year, they’ve drawn the lowest-ranked team in the tournament as their first-round opponent. Judging by Portland’s results this year—that 42-point loss to Puget, a 97-point loss to Texas, and a 192-point loss to St. Louis—they’re coming into Championships about as strong as they were last year. The only problem is, a few other teams have gotten stronger, jumping them in the rankings. (Portland was seeded 5th in 2014.) Still, they’ve got a great opportunity to take a win back to Oregon and build on something for next year. Missing out on the finals last year, Magic City is making a return and is hoping to get back to how things were in their glory days. As men’s roller derby was emerging and organizing, MCM was one of the top teams, going so far as to finish third in 2011. Yet they’ve been a blip on the Championships radar until recently. Magic City has undertaken a tough schedule in 2015. Though their three losses were against teams ranked higher than them, the results show good improvement. Opening the season with a bit of a stumble, Texas beat the Misfits 288-76. At Spring Roll in May, MCM took on Your Mom and lost by 108 points. The margin was similar against St. Louis, a 222-116 win for the Gatekeepers. But those results are much better than how things were last year. At Spring Roll 2014, the game with St. Louis was much more lopsided, with the Keepers winning by 188 points. St. Louis has become much stronger in 2015, and yet Magic City improved that much more this year. That shows you how far they’ve come from their #12 MRDA ranking at the end of 2014, and how they may be lined up for a tournament win this weekend. What a ride for San Diego. The team just gained MRDA membership at the beginning of the year, and just months later, they’re in the MRDA Championships. Not too shabby, fellas! The team is led by B.Stang, he of Your Mom Men’s Roller derby during their last few championship runs. His Aftershocks have taken wins against middle-ranked MRDA teams, including a 27-point victory over #13 Arizona in March. San Diego also played against Puget Sound at Wild West Showdown, though in an unsanctioned game, with the Outcasts winning there by 124. Again, with how the tournament format is panning out, San Diego has a pretty decent chance of taking their first win in their first MRDA tournament. If it’s not against Magic City, it could very well be against whomever they face in the consolation game on Sunday. No team is more happy to be at MRDA Championships than the TC Terrors. Ranked #14, a lot of teams ahead of them had to decline their invites to the 10-team tournament. (Such as: #9 Tyne & Fear, #11 South Wales, #12 Mass Maelstrom, and #13 Arizona.) When the MRDA came knocking with the last spot, they jumped at it. That they lost these games, all against the best teams in men’s roller derby, isn’t the story here. It’s that they went into this gauntlet full-well knowing that they were going to lose. They just wanted to find out what is necessary to compete on a high level. They got knocked down finding out, only to get back up and say, “please sir, may I have another?” to two of their opponents, who then proceeded to give them another. And they took it gladly. Even if these results only led to a 2-rank increase from 2014, them receiving the last berth in the championships bracket just feels right. Perhaps it’s unfortunate that the compressed 2-day format of the tournament may prevent a team like Minnesota from stretching their legs and showing us what they may be able to learn over a long weekend. On the other hand, if you’re going to invite 10 teams to the party, you’d better make sure the last one through the door can appreciate what it takes to be there. Safe to say, Minnesota fits that description perfectly. And the most infamous of all was at Spring Roll that same year, when they got cheated out of a win against New York.